John Osbourne (aka Ozzy Osbourne) was arrested by Memphis cops in May 1984 and charged with public intoxication. 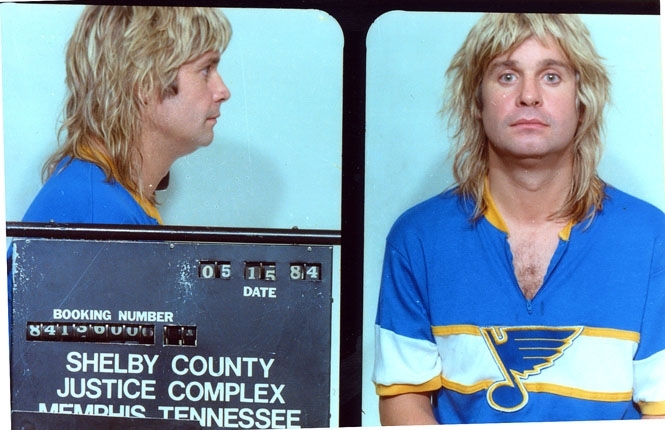 According to the police report, Ozzy was "staggering drunk" when nabbed on raucous Beale Street. Submitted by Shavespoke on Thu, 2010-10-14 14:44. Looks like something disgusting is hanging from his nostril. Submitted by SpecialEd on Thu, 2011-06-02 23:56.